The DS Arms Low Mass ESC - Enhanced Sand Cut complete bolt carrier group is the pinnacle of AR15 - M16 bolt carrier group production. We took our standard Mil-Spec bolt carrier group and upgraded with real world no-nonsense features that make sense, not just make it flashy! First and foremost we looked to our roots in the FAL Battle Rifle and incorporated L1A1 style sand cuts on the all of the load bearing surfaces of the carrier. These sand cuts allow any sand, dirt or debris that may have gotten into the action to easily be cycled out. After the sand cuts we knew we would have to give this bolt carrier group a finish that puts function over form, the durable Nitride Finish we selected for this complete bolt carrier group will provide resistance to wear, corrosion, rusting and pitting all while giving this complete bolt carrier group a nice black color. The DS Arms AR15 M16 Cut Complete Low Mass Sand Cut Enhanced Bolt Carrier Group with Nitride Finish is perfect for your next build. We machine these assemblies using the latest manufacturing techniques, material and finishes. The carrier is machined from 7075 T-6 Aluminum and the bolt is MPI 9310 material. 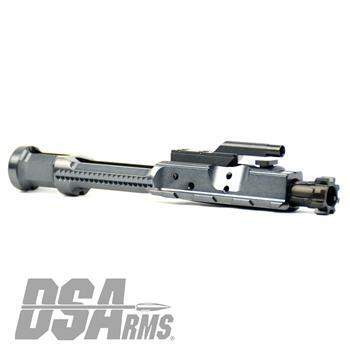 This complete AR15 M16 Cut Complete Low Mass Aluminum Sand Cut Enhanced Bolt Carrier Group includes the complete bolt, complete carrier with properly staked gas key, cam pin, firing pin and firing pin retaining pin. Due to the variations in gas system lengths, gas port diameter and ammunition we recommend using H1 or H2 recoil buffers for optimal reliability, if your barrel has a proper gas port size carbine buffers can also be used. All Testing Was Completed with NATO Spec Ammunition and NO Lubricant added. 1. Lower recoil and muzzle climb due to the lower mass reciprocating back and forth. 2. Less lubrication needed due to less friction because of the aluminum on aluminum contact between the bolt carrier and upper receiver versus the steel bolt carrier on aluminum upper receiver. 3. Weight reduction of nearly 1/2 pound which offsets the weight gained from accessories mounted to your rifle. 4. More corrosion wear resistant. 5. Helps reliability with potentially under gassed barrels and cartridges (.300 subsonic). Low Mass Design, continued to retain the forward assist serrations as well as the M16 "fill circle" tail.